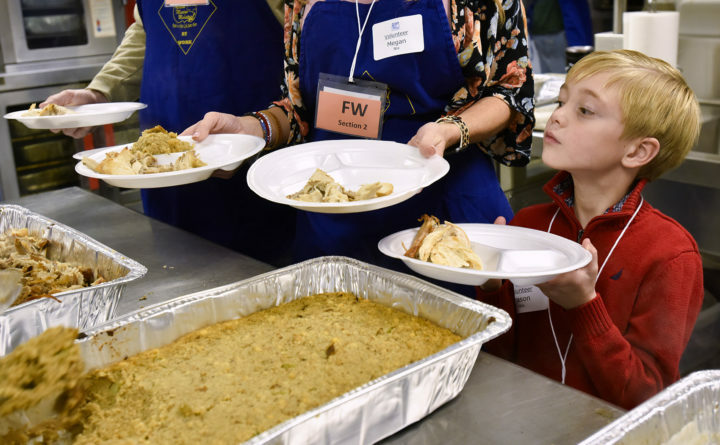 Editor’s note: This is a running list of free Thanksgiving meals. If you have one to share with us, please email it to Community Editor Julie Harris at jharris@bangordailynews.com . AUGUSTA — Le Club Calumet is hosting its free Thanksgiving Day community dinner 11 a.m.-2 p.m. Thursday, Nov. 22, at 334 West River Road. Would love volunteers. Will be collecting donations to benefit Augusta Food Bank. BELFAST — St. Francis of Assisi Church will serve a traditional Thanksgiving meal noon-2 p.m. Thursday, Nov. 22, at 81 Court St. The dinner will be provided by the church’s Social Peace and Justice Committee and the Knights of Columbus. To offer financial assistance or to serve at the dinner, call 207-233-0787. BELFAST — The fourth annual Red Knights Maine Chapter IX and Traci’s Thanksgiving dinner will be held 11 a.m.-4 p.m. Thursday, Nov. 22, at Traci’s Diner, 57 Main St. The cost is by donation. If you cannot afford to donate you are still welcome to eat. All proceeds go to Adoptive and Foster Families of Maine. BRUNSWICK — Mid Coast Hospital will host a traditional Thanksgiving dinner for staff and community members 11 a.m.-1 p.m. Thursday, Nov. 22, in the hospital cafe at 123 Medical Center Drive. For information, call 207-373-6786. CARIBOU — Free Thanksgiving dinner, 1-3 p.m. Thursday, Nov. 22, Caribou Bread of Life Kitchen, 62 Collins St.
DEXTER — Free Thanksgiving meal, 11 a.m.-2 p.m. Thursday, Nov. 22, at VFW Post, 20 Cedar St. The post also will deliver meals upon request in Dexter, Exeter, Garland, East Corinth and Dover-Foxcroft. For meal delivery, call 207-341-2056 or email vfwpost4298@gmail.com. ELLSWORTH — Annual Free community Thanksgiving dinner, noon Thursday, Nov. 22, at Ellsworth Elks Lodge 2743, 317 High St.
HERMON — Hermon Masonic Lodge free Thanksgiving dinner 11 a.m.-2 p.m. Thursday, Nov. 22, at Lynde Lodge No. 174, 2500 U.S. Route 2. HOULTON — St. Mary of the Visitation Parish will host a traditional Thanksgiving dinner noon-2 p.m. Thursday, Nov. 22, in the parish hall, 112 Military St. If you are interested in volunteering to help or making a donation, call the parish office at 207-532-2871 8 a.m.-noon Monday-Thursday. GUILFORD — Free community Thanksgiving dinner, 11 a.m.-1 p.m. Thursday, Nov. 22, Guilford United Methodist Church, 3 School St.
JAY — Bean’s Corner Baptist Church will host a free Thanksgiving meal 1-3 p.m. Thursday, Nov. 22, at 17 Chesterville Road. There will be a complete homemade meal, including dessert. Call ahead if you are coming at 207-645-2925. KENNEBUNK — St. Martha Church will host the 20th annual Project Pilgrim, a complimentary Thanksgiving Day dinner for community members, noon-1:30 p.m. Thursday, Nov. 22, at 30 Portland Road. Guests can stop by or call ahead and arrange to pick up a meal or have one delivered to their home. Transportation to and from the event is provided. If you’d like to make a reservation (although not required), set up delivery/pickup or learn more about volunteer opportunities, call 207-967-1911. KITTERY — The Church at Spruce Creek is holding a Thanksgiving dinner 1-4 p.m. Thursday, Nov. 22, at 5 Pettigrew Road. LEBANON — First Parish Congregational Church-Lebanon will host its Thanksgiving community dinner 11 a.m.-1 p.m. Thursday, Nov. 22, at the church, 650 Center Road. For more information, call 207-651-5506. LEE — House in the Woods Military & Family Retreat will host a traditional Thanksgiving meal for veterans, their families, and the community at its lodge on Skunk Hill Road. There will be three sittings at 2 p.m., 4 p.m. and 6 p.m. Those with reservations will be seated first at their requested time. Veterans and their immediate family members are free. Community members are asked to support this event by making a donation or volunteering. Call 207-738-8387 or see our event at https://www.facebook.com/events/1223305881141279. Please leave your name, number in party, and requested seating time in message. LIBERTY — The fourth annual Pay It Forward Thanksgiving dinner will be held 11 a.m.-1 p.m. Thursday, Nov. 22, at Liberty Community Hall on Pinnacle Road. A donation of a nonperishable food item to Liberty Baptist Church food pantry is appreciated but not required. MECHANIC FALLS — The Pleasant Street Baptist Church will host a free Thanksgiving day dinner 11 a.m.-2 p.m. Thursday, Nov. 22, at 59 Pleasant St. Transportation or meal delivery available. Call at least two days in advance for those services. For more information, call 207-890-0774 or 207-240-2392. NORWAY — St. Catherine of Sienna Church will host a free Thanksgiving Day dinner at noon Thursday, Nov. 22, in the parish hall, 32 Paris St. To make reservations, contact the parish office at 207-743-2606 or sign up on the sheets located in the narthex of St. Catherine of Sienna or Our Lady of Ransom Church in Mechanic Falls. There are also sign-up sheets for item donations and volunteer shifts. ORLAND — H.O.M.E will hold a Thanksgiving dinner from 1 to 3 p.m. Thursday, Nov. 22, in the market stand at 90 Schoolhouse Road. PORTLAND — Wayside Food Programs’ annual community Thanksgiving meal will be held 11 a.m.-1 p.m. Thursday, Nov. 22, at The Portland Club, 156 State St. Free and open to the public. For questions or additional information, contact Wayside Food Programs at 775-4939. PORTLAND — VFW Post 6859 will host a Thanksgiving dinner 2-5 p.m. Thursday, Nov. 22, at 687 Forest Ave.
PORTLAND — Deering Center Community Church and Wayside Food Program are providing the annual Community Thanksgiving Dinner at noon Thursday, Nov. 22, in the church dining hall, 4 Brentwood St. They are accepting pies as donations for dessert. If you are willing to provide a pie, call Howard at 207-749-6314. READFIELD — Readfield United Methodist church will host a free Thanksgiving Day dinner 11:30 a.m.-1 p.m. Thursday, Nov. 22, at 1564 Main St.
ROCKLAND — St. Peter’s Episcopal Church will host a Thanksgiving meal at 12:30 p.m. Thursday, Nov. 22, at 11 White Street. SACO — The Good Shepherd Parish and the Knights of Columbus will host the 20th annual free Thanksgiving Dinner 11 a.m.-2 p.m. Thursday, Nov. 22, in the hall of Most Holy Trinity Church, 271 Main St. All members of the community are invited to attend. A turkey dinner with all the fixings, including dessert and beverages, will be served. Free takeout and delivery are available. To set up delivery, contact the parish office at 207-282-3321. If you can help with the dinner preparations, packing or delivering meals, working in the kitchen or serving on the cleanup crew, call Ray at 207-282-9288. Donations of turkeys are being accepted now, and donations of pies can be taken to the church hall Wednesday, Nov. 21. SCARBOROUGH — Project G.R.A.C.E is hosting the third annual Scarborough community dinner 11 a.m.-1 p.m. Thursday, Nov. 22, at the Wentworth School, 20 Quentin Drive. For more information, visit thanksgivingscarborough.org. RSVP online or call 207-730-4100. UNION — The Thompson Community Center will host its annual free Thanksgiving dinner with all the fixings 11 a.m.-1 p.m. Thursday, Nov. 22, at 51 South Union St.
WINTHROP — A free Thanksgiving Day dinner will be offered 12:30-1:30 p.m. Thursday, Nov. 22, in the hall of St. Francis Xavier Church, 130 Route 133. All are welcome at the event which is organized by the Winthrop Rotary. Takeout meals are available. To sign up for delivery, call 207-377-7228.